This year I am celebrating my 20-year anniversary with the Prosserman JCC Stroke Recovery and Parkinson’s Support and Fitness Group. (Twenty years translates to over 1000 hours!) Of course back then the centre had a different name and in fact we were located in a different building. When I first began facilitating this inspiring group my children (now adult Millennial) attended the Centre Camp on campus and I was happy to be on site. My kids have since grown and flown, however I continue the routine drive up Bathurst Street on Monday mornings to the Prosserman JCC – my home-away-from-home. It’s well-known in our community that Ben and Jerry are much more than just ice-cream. 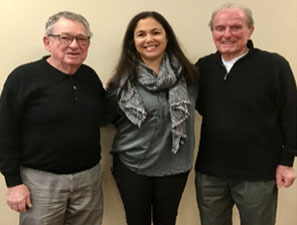 This quasi-autonomous group is spearheaded by Ben Swartz and Jerry Weinper, two longtime and exemplary members and volunteers at the Prosserman JCC. They were on the scene when I arrived way back and they share a friendship longer than my lifetime (I think). When they are not volunteering they can be found on the treadmill downstairs in the gym. These two guys are incredible role models for all of us. Thank you Ben and Jerry for your constant enthusiasm longtime commitment to this wonderful group. The world needs more Ben and Jerrys! Over the years this group has benefited from many dedicated volunteers including former Y members, members of the community and compassionate caregivers (too numerous to list). Maurice Rabinovitch and Joe Steinberg are longtime volunteers from before my time. This incredible group of people including, participants, spouses, volunteers and caregivers is a tremendous source of inspiration and pride to the staff, and members of the community at large. The group meets on Wednesday and Fridays too, but that’s Elv’s story to tell. Several members of this group are contributing authors to Brain Attack - The Journey Back - A Collection of Inspirational Personal Narratives about Stroke Recovery (PK Press, 2005, 2016). Lynne, and Alma thank you for sharing your heartfelt stories with us. We look forward to our Monday mornings together filled with music of many genres: Classical, contemporary, golden-oldies, ballroom dancing and of course sing-along favourites. Music is magical: it resonates deep in our brains and prompts our bodies to “Shake, Rattle, Rock and Roll”! We all love to sing and dance, in any way we can. But most of all, we look forward to schmoozing and sharing updates and celebrations. What’s our favourite part of the program? No question: coffee and fresh bagels. Sometimes we enjoy freshly brewed coffee with bagels, lox and cream cheese―what a great start to the week. On special occasions… we enjoy homemade sweets and treats. Mmm. The Prosserman JCC Stroke Recovery and Parkinson’s Support and Fitness Group is a hidden gem in the community. We are dedicated to the wellness of our participants; we are a caring and compassionate network. My very best wishes for a happy and healthy holiday season! I look forward to many more Monday mornings together in 2018. Until 120! Ad Meah V’Esrim! Biz a Hoondred oon Tzvuntzig!